“For over 40 years, we’ve seen it, solved it,” said SAS Executive Vice President and Chief Technology Officer Armistead Sapp in his opening remarks at the SAS® Global Forum Technology Connection. 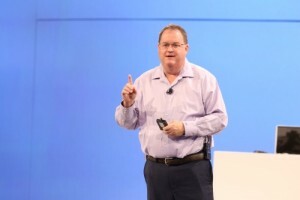 If his explanation of SAS differentiators and the road ahead serve as any indication, SAS is just getting started. 40 years of analytics in action. Technology that meets users’ skill sets. Analytics that impact the world. Since last year’s conference alone, he said, a total of 326 products have released, including 88 deployment tools and utilities. That’s a lot of code, but Sapp reiterated that SAS’ first priority to solve for quality, then performance and then new features remains unchanged. 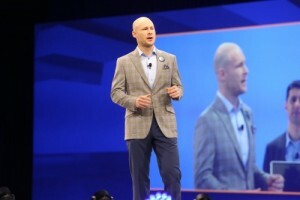 SAS CEO Jim Goodnight and other presenters announced several new offerings during Opening Session the night before, but an impressive crew of Technical Connection speakers and demonstrations gave attendees a look under the hood. SAS Senior Product Manager Mike Frost served as the on-stage ringmaster, guiding attendees through real organizational scenarios and dilemmas presented via video. “Whether you’re a data scientist, statistician, IT analyst, business analyst or even someone who employs or manages folks in these roles, you will be able to see how what we’re doing in SAS® Viya™ will deliver value,” he said. Access analytic applications from a web browser to quickly build predictive models. Access to SAS’ API for embedded analytics from any client language and incorporate them into current business applications and processes. Zero set-up, with no worries about spinning up a cluster or installing any software. Users get a secure, cloud-based location to store data to analyze and save results of those analyses. SAS Visual Analytics is running on SAS Viya. Users can move seamlessly between data exploration, report design and modeling, as three offerings have merged into this new single user experience: SAS® Visual Analytics Designer, SAS® Visual Analytics Explorer and SAS® Visual Statistics. The interface has been rewritten as an HTML5 application. Software as a Service cloud offering with volumized pricing. Omni-channel, offering the most comprehensive customer intelligence hub. Detection of threats can now be automated. The offering can pull information from websites, social media and various databases, drawing associations between disparate datasets. Can be used by analysts to perform efficient investigations. Can be configured to meet the needs of many types of solutions, including fraud, public security and more. Web-based window into a seamless administrative experience. Can process simple alerts and it can use machine learning to identify problematic conditions that have not yet been modeled. SAS Viya architected to make maximum use of the capabilities in these technologies. Vice President of Product Management Ryan Schmiedl offered closing remarks, talking more about the journey SAS and its customers have been on over the years. Highlights from SAS Global Forum: Technology Connection was published on SAS Users.